During the Japanese War of 1938, the Chinese government is forced to retreat to Wuhan. Wai (Andy Lau) was born to a powerful family that had extreme influence over the government. He joined the air force with the purpose of paving his way toward a future career in politics. On a routine message delivering mission, Wai runs into Japanese fighter planes. 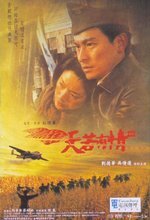 After a severe gun battle, he is seriously injured and is forced to make an emergency landing in a small village in the hills, where he is rescued by Wo (Wu Chien-Lien), a kind hearted village girl.